I cleared out the areas next to the house last year, knowing the contractors would trample anything that was there installing the siding. Luckily, I have so many varieties of hosta that I just took some baby starts, and cut out a piece of a few others to transplant into this shady area along the house. With the cool weather and regular rain, I'm sure they will be fine. Now I must ask my husband if the septic cleanout stack really needs to be that tall! The hosta I put around it will get quite large, so hopefully they'll hide it even if we don't cut it down. I love free plants like that. How long before they settled in for you? Mine are finally getting mature enough to start giving me more and it is so much fun. I am going to try my hand at dividing a couple of Hosta next Spring...or Fall before they go dormant. I'm sure it won't take too long for your hostas to cover the septic cleanout stack. You could always paint it green so that it won't be noticed among the plants. Hey, I could paint the tube! How about an Iowa State Cyclone theme? I could paint it red & yellow and put a football helmet over the top. I'm kidding, but my husband and son would probably love that. Hostas grow like weeds here, I just keep cutting them up and they just keep growing. I continue to divide because they get so huge, then they just come back bigger. I'll take a photo again in the fall, this area will probably be covered. I'd love to see the photo in the fall. 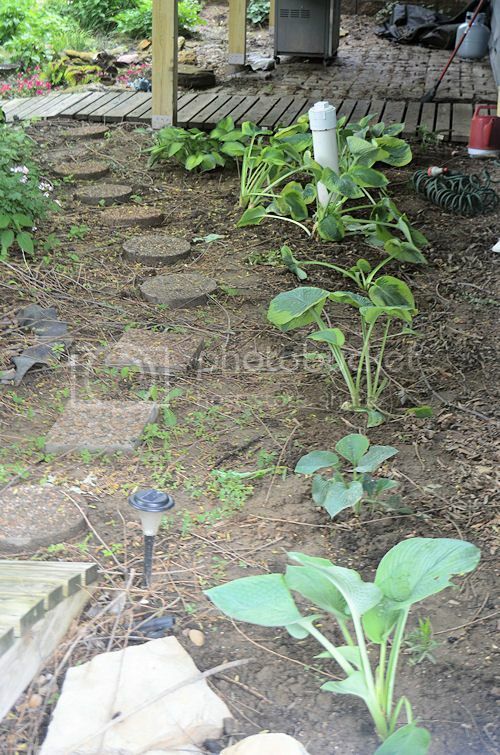 I like how you have arranged this area with the stepping stones, mulch and hosta. Lucky you! Those hostas look good already, can't wait to see how they look later.